Free Shipping Included! 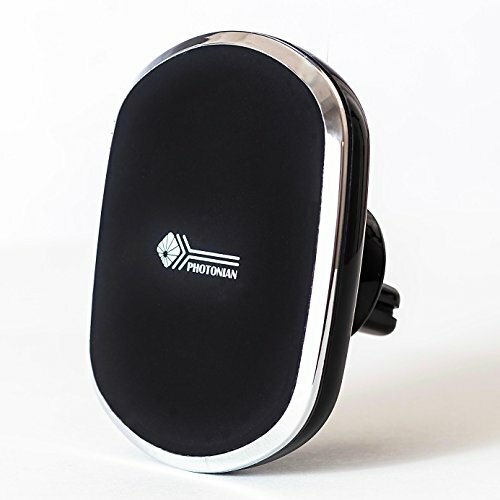 Photonian Wireless Car Charger & Phone holder by Photonian at All Company Mobiles. Hurry! Limited time offer. Offer valid only while supplies last. Photonian Wireless Car Charger & Phone Holder Photonian Wireless Car Charger & Phone holder brings you premium charging experience while driving. Standard Amazon return policy applies and will be processed by Amazon. This Wireless Charger only works for Qi-standard supported devices. If your device does not have built-in Qi-standard wireless charging function, a separate wireless charging receiver is needed. The QuickCharge function does not support when connected with lightning cable. A different cable that supports QuickCharge (9V/1.7A) is needed. Type-C USB cables support quick charging and enhance charging speed. Mobile devices with cases can be used. Too thick cases may slow down the charging speed. Please read the user's manual before using the product. Devices can be mounted in horizontal or vertical orientation. If you have any questions about this product by Photonian, contact us by completing and submitting the form below. If you are looking for a specif part number, please include it with your message.